HONG KONG (Jan 27): The world's most famous measure of volatility in financial markets is flashing a sign akin to boredom — languishing around levels that prevailed before the global crisis. Problem is, the VIX is tied to the US S&P 500 index. Take a step back to look at the global picture, and the early days of 2017 are showing elevated jumpiness similar to that seen in the past two years. Emerging-market currencies lead the pack, illustrating both the dangers and potential returns from investing in assets ranging from Egypt's pound to China's yuan. An investigation into price fluctuations across financial markets over the past two decades by Bloomberg shows how the beginnings of the past two years have had the biggest volatility since 2009, when the world was reeling from the Lehman shock and the money-market breakdown it unleashed. Volatility is likely to trend higher through the course of the year as markets react to a range of unknowns, not least the impact of US President Donald Trump's agenda, observers say. Economic policy structures are being reshaped in ways unseen perhaps since before World War II, JPMorgan Chase & Co. strategists said in putting a premium on liquidity in new US stock portfolios. "I don't think investors have really felt like volatility is falling relative to the last couple of years," Stuart Rumble, investment director with the multi-asset team at Fidelity International, said in a phone interview from Hong Kong. "We've seen such a dominant trend over the last couple of months in markets, as investors have been positioning for economic growth and higher inflation following the US election." Looking at 250 assets across market classes that include equities, sovereign bonds and commodities, eight currencies were volatility outliers based on their year-to-date price swings, or Z-scores, according to data compiled by Bloomberg as of Jan. 20. A Z-score is a normalized measure based on price standard deviation, which gauges a security's moves compared with a longer-term average (1997 to 2017). For all the disruptions Trump has brought to longstanding US policies and practices — from trade to regulation — this month is still somewhat less volatile than the past two Januaries. Markets were roiled by confusion over China's currency tactics and stock slide at the start of 2016 and by Switzerland's surprise removal of a cap on the franc in early 2015. Three weeks into 2016, there were 19 outliers: 16 currencies and three benchmark equity indexes. At the same stage in 2015, there were 10. That followed a five-year period of relative calm preceded by an eye-popping 53 outliers at the start of 2009. 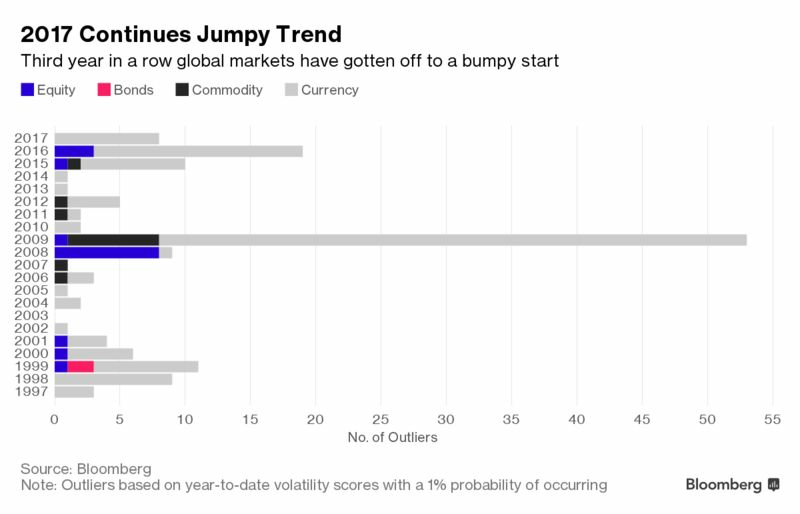 The Egyptian pound shows up as the most volatile asset in the study's universe so far this year. With a Z-score of 4.15, it has been more than twice as volatile as the digital currency bitcoin and six times more jumpy than the Bloomberg Dollar Index. To be classified as an outlier in this study, an asset needs an absolute Z-score of 2.575 or more, which means its movements have less than a 1% chance of happening. The greater the score, the greater the volatility. Looking just at the commodity sphere, lean hog futures posted a Z-score of 1.86, making them the most volatile in that group. Hogs also led the commodity herd in early 2013 and 2015. While a global selloff in bonds since Trump's presidential election victory spurred some to call the end of a three-decade bull run in debt, sovereign securities don't stand out as volatile based on their Z-score calculations. On the policy front, one danger for investors to be aware of is that, unlike in past years, central banks may not be the security blanket during times of volatility that they have been. "Investors can no longer anticipate that automatic response of additional monetary policy when economies or markets take a downturn," Rumble said. "That's really what's different going forward over the next several years, and it means when we see those key risk events, we could see some shock and volatility."